The Reds head to Wrigley Field tomorrow to take on the Cubs in a long, four-game series. The Cubs entered the season as a popular up-and-coming pick on the basis of both their outstanding cadre of almost-ready position prospects as well as an active offseason that saw the acquire or sign Jon Lester, Jason Hammel, Dexter Fowler, and Miguel Montero. Perhaps as expected, they have seemingly taken that step forward this season and are locked in a dead heat with the Pirates for second place in the NL Central, albeit well back of the seemingly untouchable Cardinals. They've played almost exactly according to their preseason projections (record-wise, at least), and are projected to have a better-than-even chance of landing a wild card playoff spot. As good as this season has been for them, however, their underlying numbers aren't quite as strong as their record. 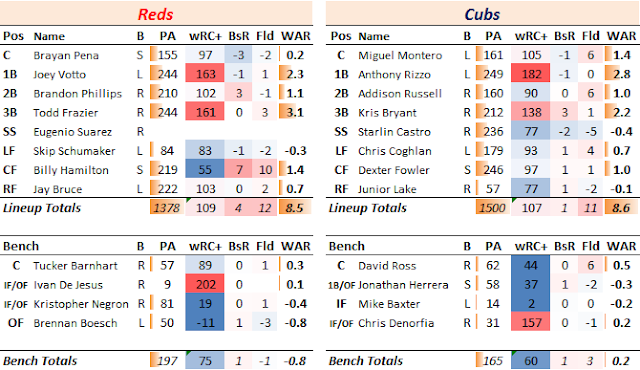 Their offense has been well below-average thus far, with the Reds taking a clear advantage in power. Their starters have been excellent and their relief corps has been "fine," but it would seem that they are in need of some offense if they want to make something of this season. The nice thing about having the kind of youth they have, of course, is that one can hope for better things in the future. I think they've got a realistic shot. Zack Cozart's injury was heartbreaking to watch today. I'm no doctor (not that kind, anyway...), but it looked to me like he hyperextended his knee pretty badly when he slid/missed first base. That makes one worry about an anterior cruciate ligament (ACL) injury, which is often repaired with surgery. I don't know recovery times off-hand, but my hunch is "long." It's so frustrating, because Zack Cozart had somehow transformed himself back into the player we all hoped he might be when he broke in with the Reds: a brilliant fielder and a solid hitter with very good power for a shortstop. It was only 200 plate appearances, but it's hard to have watched the amazing turnaround he's experienced thus far in 2015 and not think that something has clicked for him. With 1.6 fWAR, he's already topped his total from 2014, and has only received a modest boost from his fielding in that metric this year. His .202 ISO is easily the best of his career, as is his walk rate (despite his claims about being more aggressive). His ground ball rate is down, his strikeouts are down, and he's not even showing a strong BABIP (low for his career, though consistent with a more fly ball heavy approach). Here's hoping he can completely heal from this injury, even if he misses the rest of the season, and doesn't see a loss of mobility sap his fantastic range. Best wishes on a full recovery, Zack. ...As for the Cubs, Anthony Rizzo is fantastic. Kris Bryant has been pretty much as-advertised and will be fun to watch this series. Addison Russell has recovered pretty nicely from his disastrous start and almost has his batting line back to league average. David Ross is the best catcher the Reds ever released. And Starlin Castro probably needs to be worried about his job, as the Cubs have other middle-infield options in the minors and Russell looks ready to go. The Reds catch a break this series with Reds-killer Jorge Soler on the DL. 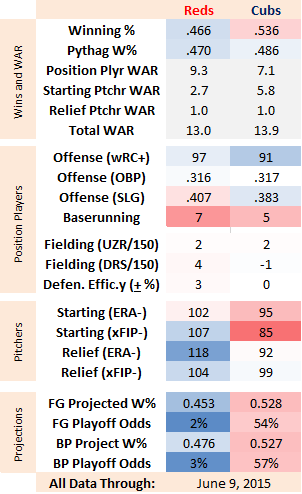 Tsuyoshi Wada is sort of the penultimate soft-tossing lefty, and there's an argument that the gap between his ERA and his peripherals is due to his low velocity. I've long been a Jason Hammel fan (he's an old fantasy guy of mine), and it's great to see him having such a nice year. He has the best xFIP of any starter in this series, and his duel against Johnny Cueto could be really fun to watch. 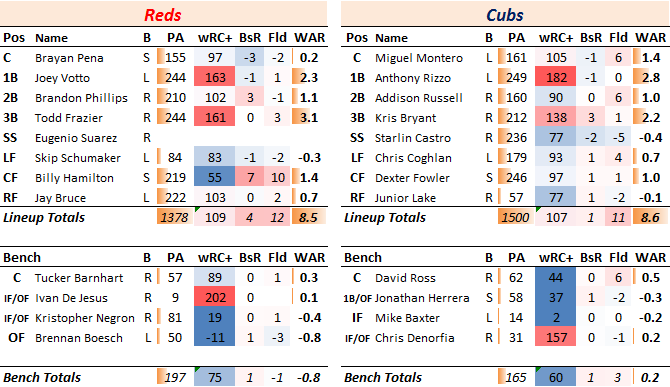 Finally, while I don't have much to say about Kyle Hendricks (a soft-tossing, control righty), I'm looking forward to a rematch between the pickoff-challenged Jon Lester and zippy skippy Billy Hamilton...assuming Hamilton is healthy enough to play by Sunday. It's pretty hard to argue with with Reds' decision to demote Jumbo Diaz given his mind-numbingly frustrating tendency to give up the long ball this season. But it was still the case that he has the best xFIP and best SIERA on the staff. They stuck with him through June, however, and used him almost always in high-leverage situations. Remember when he hit 102 mph in his last appearance, right before giving up the big hit? I still just love that guy. Hopefully he's ridiculous-dominant in AAA and makes it back up sooner than later. I think the Reds would be foolish to give up on him. Cubs pen: it's been pretty strong. Justin Grimm has been a strikeout-and-walk machine this year, and looks like the bullpen suits him a lot better than the rotation. They have a pretty impressive cadre of long-men between Travis Wood and Edwin Jackson.